We started the inflatable hot tub reviews because many people would like to have a hot tub but the high price tag most of the time make them decide against it. But if you still like to soak in a hot tub after work or just for relaxation, we found affordable alternatives in the inflatable hot tub reviews we did and found that they can give you just as much pleasure without that average price tag of 4,5 or 6 thousand dollar. The prices of inflatable hot tubs are very affordable and compared to what you get the hot tubs we reviewed will give you a good bang for your bucks. Like always in our reviews we make a recommendation for the top 2 or 3 products. In this case there are two inflatable hot tub that we think we can recommend more than any other one. You can read the in depth reviews of our top 3 here. If you have read one of our reviews before you might know that we basically never review any product under 4 stars and this top 3 of the best blow up hot tubs is no exception. 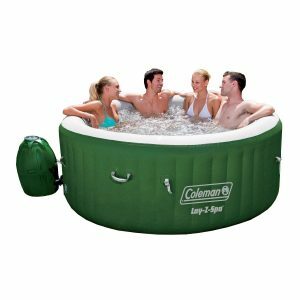 This inflatable hot tub is made by Coleman is our personal recommendation as the best buy. With its 4 -6 person capacity and large 77 inch diameter it holds 254 gallon water. The walls are inflated and build up from TriTech material for strength, comfort and are very durable. The installation is very easy and does not require any tools. You can use the pump that comes with it to inflate the hot tub. We found about 900 reviews of this inflatable Coleman hot tub and that is more than any of the other 2 models and brands we looked at. With about 80% of the buyers giving it a 4 or 5 star rating I think this a is pretty good score. The lower ratings talked about the pump giving them trouble and it showed an error E01 code after some loud noise. This inflatable spa will give you a lot of hours relaxing and enjoying the jets according to many of the reviews we read on several online stores and forums. 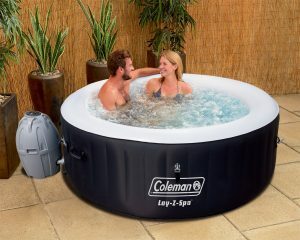 Although it seems that with a 10% 1 or 2 star rating it seems not to be a very good choice if you look at the higher ratings most users are pretty happy with this Coleman hot tube. Although advised not to be used under 40 degrees I read many people who used it all winter long without any problems. The filters have to be removed and cleaned from inside the spa and is no problem at all unless you got dressed already than you have to reach inside again. Several taller people over 6’4″ mentioned it was no problem for them to sit in it and still be comfortable. Adding up all the pros and cons and after reading a lot of the ratings and reviews for the Coleman Lay Z Spa Inflatable Hot Tub we can recommend this as a good bang for your bucks and our number one recommended inflatable hot tub. This Intex hot tub is the same size as the Coleman Lazy spa this makes it a better comparison. One of the options we did not find in any other inflatable hot tub is the hard water treatment system for softer water. This Intex 77 inch hot tub is recommended for 4 people and hold a little less water than the Coleman with its 210 gallon. We have been scrolling through and reading a lot of the over 1300 reviews and found a little higher number of lower ratings for this inflatable spa. Most named was that the heating did not worked or gave out fast after using it a few times. The higher ratings are pretty happy with it and would buy it again. 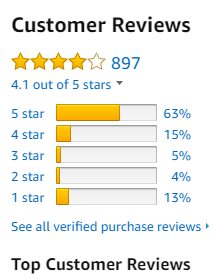 There is still a 65% of the buyers who gave it a 4 and 5 star rating. Read more customer reviews here! Although more people gave this Intex a little lower rating we think it deserves more than that and we gave it a 4.0 stars. Remember that you buy an inflatable hot tub and not a thousands of dollar costing hard walled spa. for the price you pay for this we think it performs pretty well and one thing is that it is not using a lot of electricity. We still think that the Coleman we reviewed above is the better buy but this Intex is not bad at all. This Coleman can be used by 4 people and it is our opinion that that is most of the time the number of people who will use it. Reason for us to see if it is as good as the Coleman Lazy spa we reviewed earlier. Overall it got higher ratings but from lesser people so it is hard to conclude anything from that. Although with over 60 people giving this ratings we can not ignore the high ratings of an average of 4.2 stars. 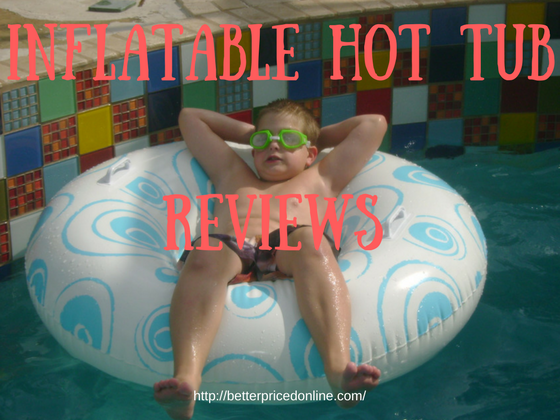 Compared to the other inflatable hot tubs we reviewed on this page the number of lower ratings is a lot lower. We only found about 8% lower ratings and more 3,4 and 5 star ratings for the Coleman Miami hot tub. Like all others the main complaint were about the pump and not staying inflated. These two point are the weak spots of any inflatable hot tub and will because of that reason cause the most problems. Read more customer review here! We looked at the pros and cons and will list them here for you. 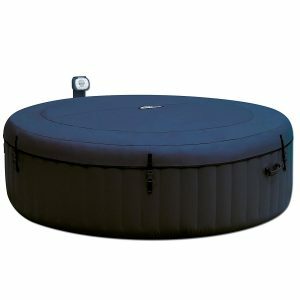 The ratings are pretty good for this inflatable and portable hot tub and it seems that filling and emptying is pretty eaay. This makes it easy to take it with you on vacations. The heating up takes a little long with 24 hours but the energy use is low also. Most users are pretty happy with it and we agree with the overall rating of 4.2 out of 5 stars. Like every inflatable hot tub or spa the pump and the wall gave the most lower ratings. Overall we can recommend this as a good buy compared to the price. If you still need more choices you can have a look at our hot tubs under $500 recommendations here. After doing these inflatable hot tub reviews we found that a lot of people still have questions. We try to answer the ones we thought are most related to the hot tubs we reviewed here for you. What you get is a hot tub for a very affordable price that will give you the same comfort and bubbles as a hard walled one but them for a fraction of the price you would pay for that hard walled one. If it is worth it depends on how much you take care of it in my opinion and of course if you buy one of the brands we recommend since they are in our opinion best inflatable hot tubs. There are a lot of people who like to find a 4 season inflatable hot tub so they can use it all year around. Suggestions from people who do use their spa all year are to make sure that under the hot tub is enough insulation to prevent cool of through the ground. Some even build it on a sort of platform for even more insulating power. Remember that the heating element will turn of as soon as you hit the bubble option and so does the pump that pumps the water through the heating element. Heating will also kick in more frequent and this will rise the cost of energy. Use a cover and try to cover your hot tub with a thicker blanket if this will help. There are wraps available for improving insulation. For real cold place like Canada I read people having an extra heater unit connected to the inflatable and some even placed a kind of tent around it. How much money does it cost to run and inflatable or portable hot tub is a question we see a lot and decided to answer since this might be part of you decision after reading our top 3 inflatable hot tub review. On average we found in the inflatable hot tub reviews that use about 1250 watts with the heating or pump running. It is all depending on your usage and form of insulating and outside temperature to make any estimate on the energy use. I will try to make a estimated guess. The average price of electricity in the United Stats is 12 cent per Kilowatt-hour. This means that in the case of 1250 watts we can calculate this: 1.25 Kilowatt x 12 cent = 15 cent per hour. This means that if it would run day and night it would cost $2.88 per day. Since it will not run whole day it will be a lot lower. Just remember this is rough estimate with average prices but it will help you maybe calculate it with your electric prices. Overall any inflatable hot tub is not the same quality as a Hard walled hot tub that is simple. It is just like an inflatable pool and a hard walled pool. So if you expect it to last just as long you better spend a couple of thousand dollar on a “real” hot tub.